What is Juvederm Voluma™ XC? 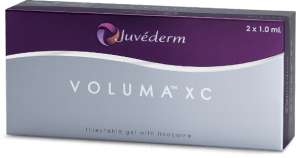 JUVÉDERM VOLUMA™ XC injectable gel is a smooth, colorless hyaluronic acid (HA) gel that contains a small amount of local anesthetic, called lidocaine. HA is a naturally occurring sugar found in the body, whose role in the skin is to deliver nutrients and help the skin retain its natural hydration and pliability. 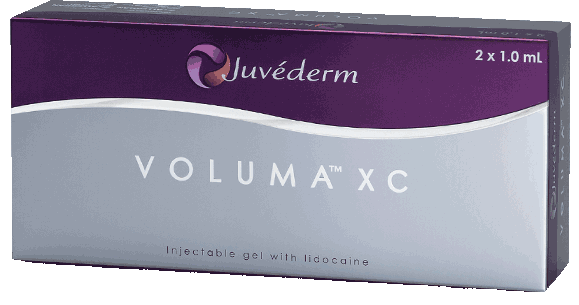 JUVÉDERM VOLUMA™ XC is for deep (subcutaneous and/or supraperiosteal) injection to correct age-related volume deficit in the mid-face and bring youthful fullness back to your cheeks. A total of 3.5 mL of JUVÉDERM VOLUMA XC was injected into the zygomatic arch, anteromedial cheek, and submalar region. In the clinical trial, the total volume injected ranged from 1.2 mL to 13.9 mL, with a median of 6.6 mL, to achieve optimal correction for all 3 subregions (Average client requires 6.6 syringes to achieve complete correction). What is Voluma best for? As we age, the cheek area loses its youthful shape. The cheeks flatten out and the skin may begin to sag. JUVÉDERM VOLUMA™ XC injectable gel is designed to temporarily reverse these signs of aging. It is a gel that is injected into the cheek area to lift the skin. It temporarily adds volume to the cheek area and results in a smoother contour and more youthful appearance to the face. Figure 1 shows the treatment areas for JUVÉDERM VOLUMA™ XC. It is injected into the cheek area using a small needle. It temporarily corrects volume loss in the cheek area and gives the refreshed appearance of a more youthful, smoother skin surface. Juvéderm Voluma XC is typically used for restoring cheek or mid face volume loss and also to help restore a more youthful curve and position to the higher area of cheekbones in women (not men). In other countries such as Europe and Canada Juvéderm Voluma has been widely and very successfully used for lifting, volumizing and re-contouring the face and jawline. Injection using little blunt microcannulas in addition to traditional small needles is also widely used for helping create a natural look while minimizing discomfort and bruising. Juvéderm Voluma was specially designed to fill and lift the mid-face and cheeks. It uses a new advanced technology from Allergan which is called Vycross that results in a smooth gel that flows easily and consistently and which can be nicely sculpted. This special cross-linking technology not only produces the lift and fill that is unique to Voluma, but it also contributes to its long-lasting nature. Is Voluma the Best Dermal Filler for Me?